A few years ago, I went on this huge energy ball making spree. I made energy balls of ALL different flavours. I’m pretty sure I tried every flavour possible at some point or another. 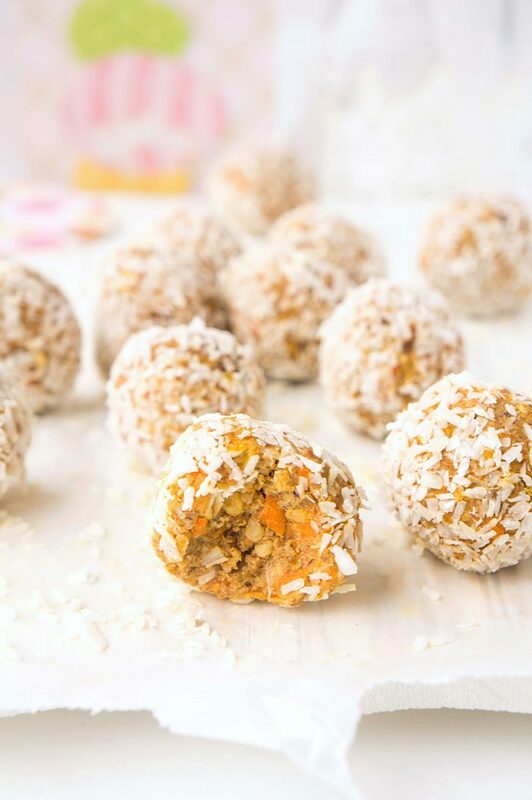 Although I enjoy switching up the flavours of my energy balls, one flavour that I’ve always had a soft spot for are these No-Bake Carrot Cake Energy Bites. To be completely honest, I went a few years without making them because, well, life just got in the way. But then one day, I was trying to think of creative snacks that we could take on the go for our little guy. And with Easter just around the corner, into my head popped these tasty little bites. 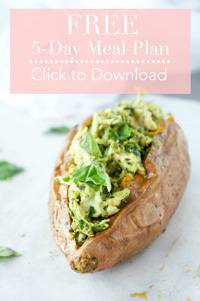 The best part is, like many of our recipes, they are so easy to make! The first thing that you’ll want to do is soak the dates in some boiling water for at least 20 minutes. I don’t know about you, but the dates that I normally buy are usually rock hard, so soaking them softens them up enough to blend them in with the rest of the ingredients. While you’re waiting for the dates to soak, you can blend the walnuts, pecans, oats, cinnamon, nutmeg and salt in the food processor until they’re finely ground. This is especially important if you’re giving these bites to younger babies since you don’t want them to have large chunks of nuts in their bites. Next, add in the soaked dates and shredded carrots and process until well combined. This is where you’ll need to play around a bit. With your hands, feel the consistency of the mixture. If it seems too wet and sticky, add a bit more of the oats. If it seems too dry, add a bit of water, one tablespoon at a time, until you reach the desired consistency. It should be sticky enough to roll into balls. Next, roll in some unsweetened coconut. You can store these bites in the fridge for up to a week. Or better yet, after you’re done making them, place them in an air-tight container and place them directly in the freezer. That way, you’ll have a whole bunch of ready-made snacks to take with you on the go! These are especially great for little ones when they want a little bite to eat, but you don’t want to create a crazy mess. 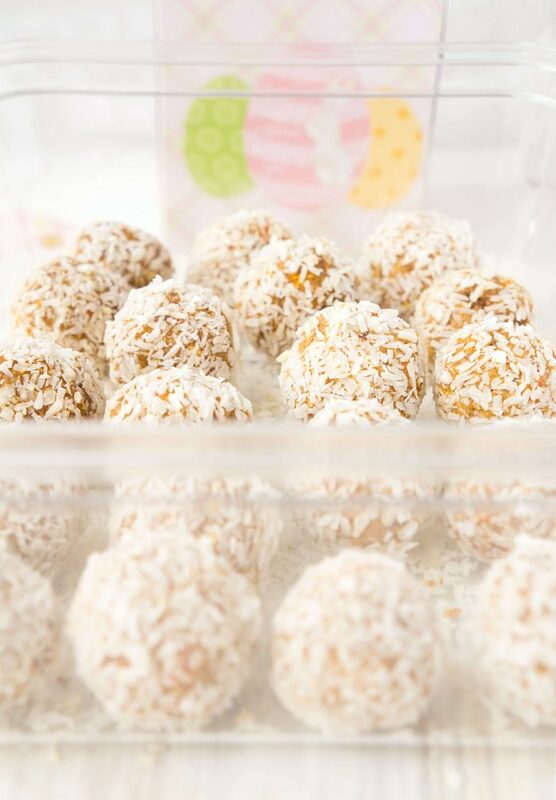 What Makes these No-Bake Carrot Cake Energy Bites Healthy? One of my favourite parts about energy balls, beyond the fact that they taste amazing, is that you can load them up with so many good-for-you ingredients. Dates – add that natural sweetness so that no added sugar is required. They’re also jam-packed with fibre, as one-half cup of dates provides 6 grams of fiber. They’re also a good source of vitamin B6 and minerals such as potassium, magnesium and manganese. Carrots – are especially rich in beta carotene, fiber, vitamin K, potassium and antioxidants. Carrot consumption has been linked with benefits for heart and eye health, improved digestion, as well as reduced risk of cancer. Nuts – are a good source of healthy fats, which are good for the heart and overall brain development. Oats – are a source of soluble fibre which can help you feeling full for longer and keep that blood sugar level stable. All of those benefits in these cute little bites! They make for a great snack or breakfast on the go, or you can even give them as a gift this Easter! 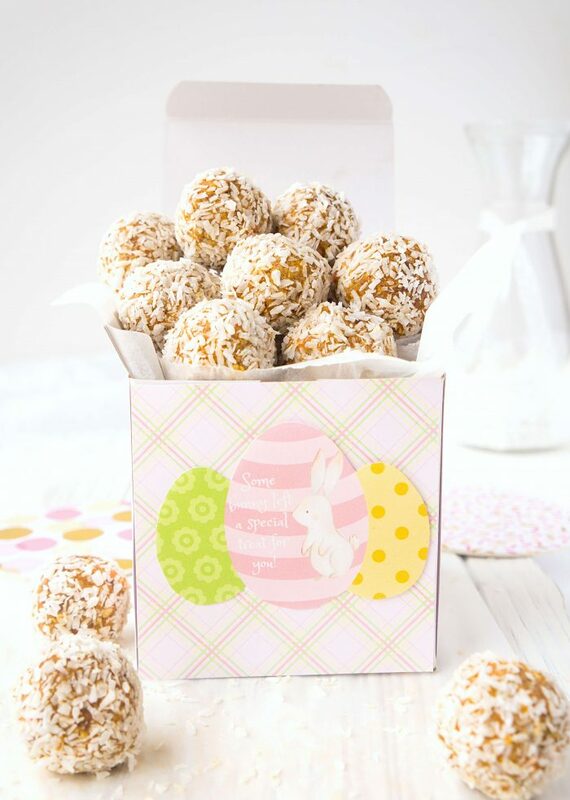 Wrap them up in a cute little bag or box and you’ve got a healthy little treat to share! 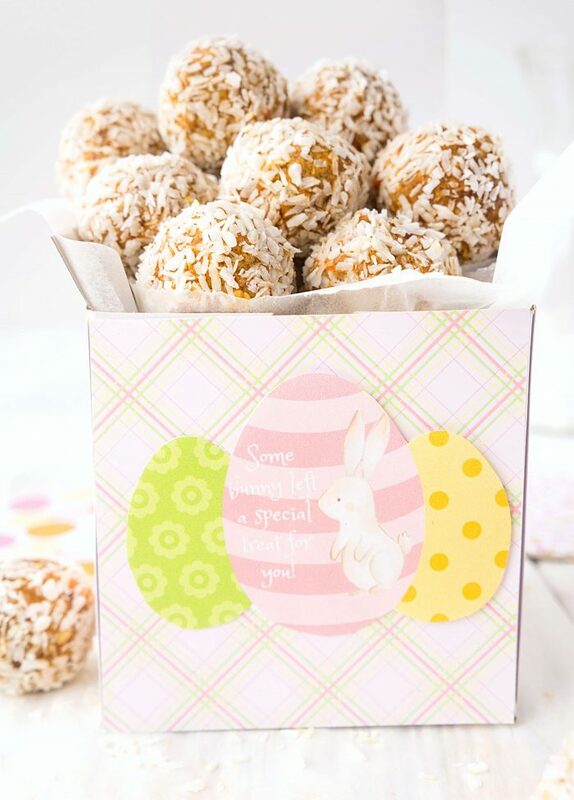 I’ve even helped you out by creating this cute label that says “some bunny left a special treat for you.” You can download the labels in my free resource library HERE. Soak the dates in some boiling water for at least 20 minutes. While waiting for the dates to soak, blend the walnuts, pecans, oats, cinnamon, nutmeg, salt and vanilla extract in the food processor until they're finely ground. This is especially important if you're giving these bites to younger babies since you don't want them to have large chunks of nuts in their bites. Next, add in the soaked dates and shredded carrots and process until well combined. This is where you'll need to play around a bit. With your hands, feel the consistency of the mixture. If it seems too wet and sticky, add a bit more of the oats. If it seems too dry, add a bit of water, one tablespoon at a time, until you reach the desired consistency. It should be sticky enough to roll into balls. Next, roll each of the bites in some unsweetened coconut. Store in an air-tight container in the fridge or freezer. 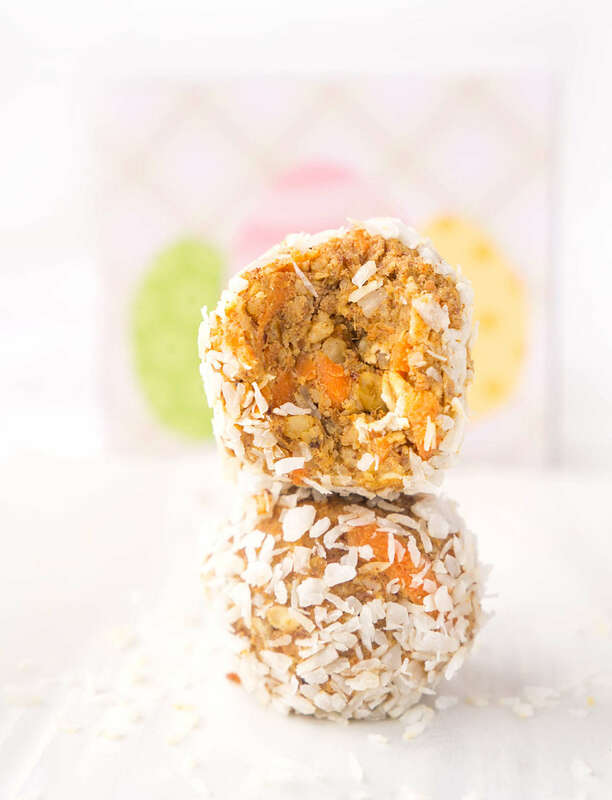 If you have a chance to try out these No-Bake Carrot Cake Energy Bites, I’d love to see your pics! Tag me on instagram @hauteandhealthyliving and use the hashtag #hauteandhealthy! Looks so delicious and unique! 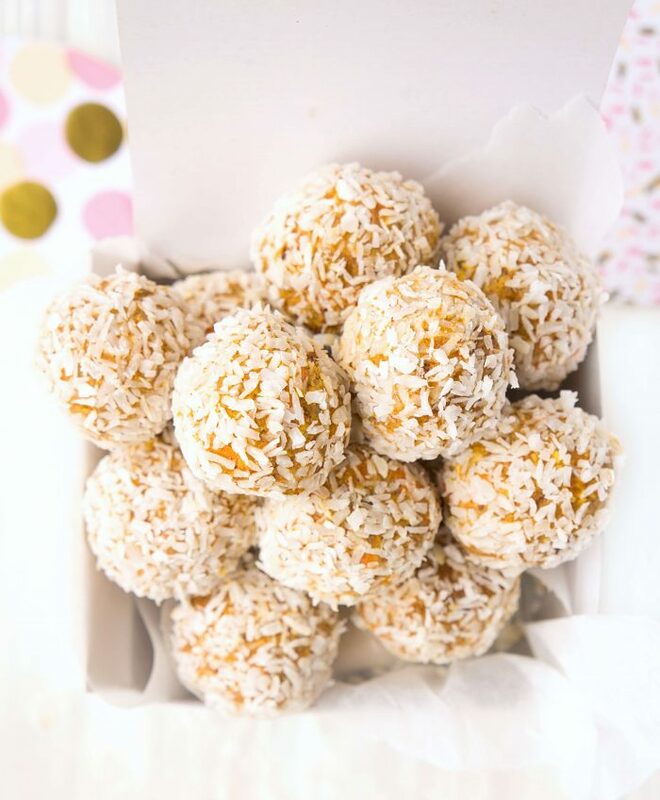 I love carrot cake and these energy bites sound amazing!